As an artist, I've always loved to learn and study how to make art, but its even more exciting to finally introduce a small part of my own vision into the world...through my new Etsy shop"Passeridae Americanus"! I have personally created a new series called "Midnight Letters". These small paintings will capture the eye and imagination of anyone with a love of whimsy and nostalgia. Each piece depicts the letter of a name, within the environment of starry skies and friendly creatures. My inspiration for these pieces comes from the stories my mother used to tell my sister and I as children. Each night I would rush through brushing my teeth and putting on pajamas (most times on backwards) just so we could delve, hand in hand, into the adventures of Lucy, Susan, Peter and Edmund; Paddington, the Runaway Bunny, and so much more! Here s a little taste of what I'm talking about. Each piece is hand made with care, as I make my way down the alphabet and memory lane. In a months time, I will be open to custom orders as well, depending on the letter and design desired by the buyer. Please leave your reviews and comments, either here on the blog, on the shop, or on my new Facebook page here. Illustrations are probably the closest expression of human thoughts within the visual world (at least I think so). Its linear quality simulates the lightning fast, abstract nature of ideas and moments as they travel through our minds. Besides painting, illustrations are my favorite way to make art. One illustrator that I admire is Renata Liwska. Her work in "Pandas and Such", "The Quiet Book" and "The Loud Book!" are so intuitive. They encapsulate the feelings that occur in the most sweet and under-appreciated moments of everyday life...within a lifetime. 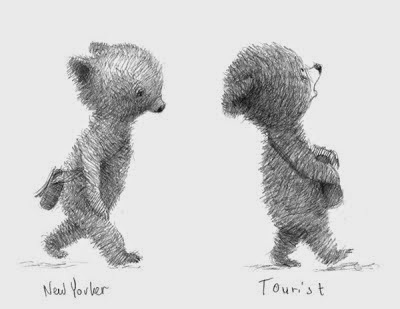 I love the illustration above in particular, with its kinetic scratchy quality; so accurately depicting life in New York City. Any day of the week, I can enter the subway system, only to get caught behind some poor unsuspecting group of tourist. Its not their fault that they out of sorts, feeling awed (or appalled) at the wonder that is the MTA. Or how about when I walk into ANY Eric Kayser pastry store downtown, only to file behind ten tons of European vacationers. There I am trying to go my way, while they want to stare at every playbill in Times Square, clogging up the streets. All I can think is, 'Please don't think I'm trying to mug you as I brush by way too close for comfort; I'm only trying to get to work on time'. This illustration really speaks it!